During the past year, the artist Jakob Kvist, Catch and Nordvestskolen, a primary school in Elsinore, have cooperated around the development of a light installation for the school. A Colorful Institution is a site-specific installation that is based on the school’s values, functions and history. Nordvestskolen was build in the 1970es and appears worn out today. When it was build, the architecture represented the new ideals for teaching; the cluster of low leveled buildings were suppose to support accessibility, a flat hierarchical structure and induce a sense of security in the pupils. Due to the current condition of the school these ideals are no longer conveyed through the architecture. It is no longer an institution the pupils are proud of or identify. As his point of departure, Jakob Kvist has used the idea of a covered main street, as this was incorporated in the original architectural plans but never realized. Jakob reinterprets the original idea through colored glass. In daytime, the natural light will pass through and during the night incorporated LED-lights will illuminate. The colors of the installation originate from the values of the school, which are formulated and printed as colors and these, all the pupils know. Through A Colorful Institution the aim is to upgrade the school area and increase the feeling of safety and happiness and through these; learning. 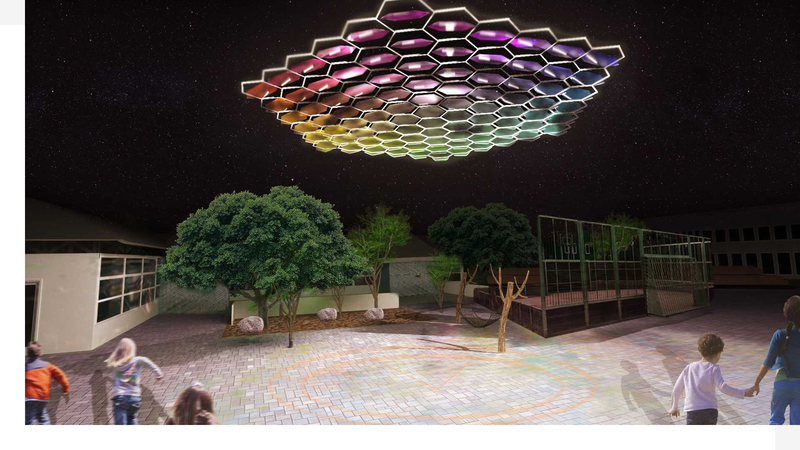 As Nordvestskolen is located at the second highest point of Elsinore, the installation will light up across the city and become a colorful landmark for the area and not least the school. Jakob KvistJakob Kvist uses light to convey stories as well as to emphasize and create new dimensions in the existing buildings and landscape. By using light he creates artistic landmarks and site-specific installations that provide the viewer with a new understanding of the urban space and the architecture around. Previously, Jakob has made artworks at Nikolaj Kunsthal, Trekroner (Roskilde), Hotel Generator, Copenhagen Art Fair, Roskilde Festival, Strøm Festival and Frost Festival as well as the award-winning light installation at Tietgenkollegiet (2013).